An unpretentious pub just off Oxford Street, near the large Royal Mail sorting office. 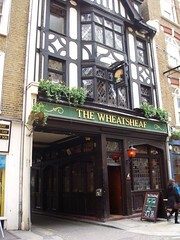 It may not have seen some of the overhauls that other drinking establishments in the area have seen, but in many ways the Wheatsheaf is all the better for it. It's still a friendly local pub, carpeted, with banquette seating and plenty of tables in a darkened, recessed interior. It gets busy after work on weekdays, in common with everywhere in the West End, but it never seems too crowded or rowdy. There are three handpulls for ale, as well as draught lagers and cider. On our most recent visit in October 2010, the ales were London Pride (£3.10/pint), Old Speckled Hen, and Abbot Ale; on an earlier visit in November 2009 they were Ringwood Best (£3/pint), London Pride, and Young's ordinary. They seem to do very basic pub food at lunchtimes, but we're not sure if this is also available in the evenings. Smokers can use the alleyway just to the side of the pub (there's a side door). Accessibility: A step up to get in. Toilets are up a flight of stairs with a somewhat wobbly handrail. Last visited by Kake and friends, October 2010. Last edited 2013-05-10 08:14:41 (version 6; diff). List all versions. Page last edited 2013-05-10 08:14:41 (version 6).